Ed Menendez Blog - AvaTint Launched! Tuesday, June 30 2009 11 p.m. 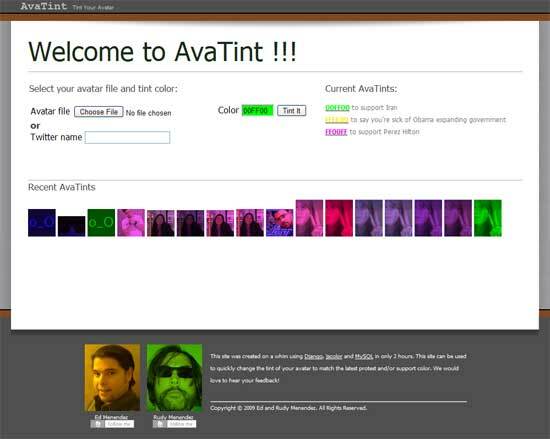 The site very simply takes your avatar and turns it into any color you select. The online community is starting to do this to support and protest many things. This is the 2.0 way of making your page background black for a cause. We created this site in 90 minutes using Django on June 19th. I got home from dinner and noticed that some twitter icons were coming in green. This caught my attention because I had suggested yellow to protest Obama's massive government spending a few days earlier. I mentioned this to Rudy Menendez (yes related) and suggested it would be useful for the less tech savvy to create a page to change an avatar's color. We knew the Pyhon package PIL could do this and Rudy found jscolor as a color selection tool. Together we created and deployed this application. If anyone is interested in helping maintain and enhance the site, please contact me or Rudy.